So I have been away, and when I am away I get to do three things more than I do at any other time of the year. 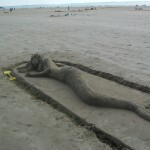 Write my novels, body boarding, more about both elsewhere, and sand-sculpt. 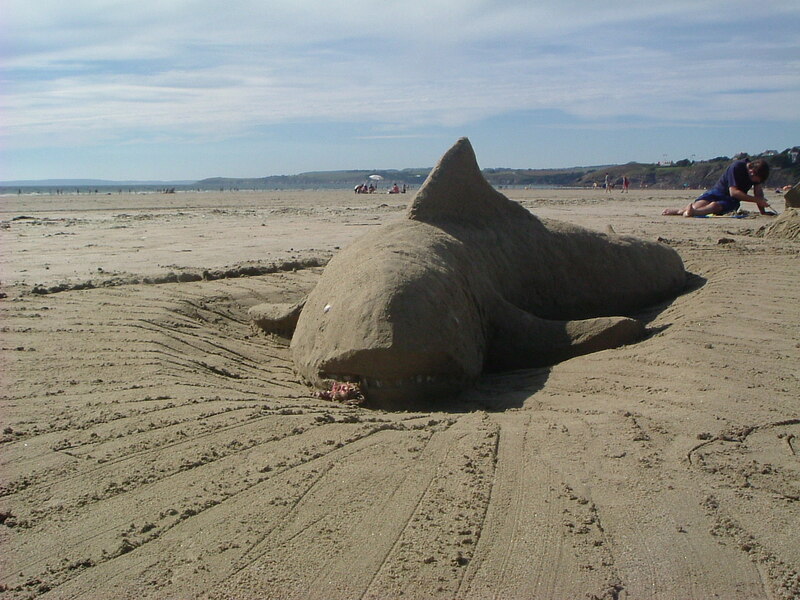 Now if you were expecting those magnificent semi-permanent structures created by teams of professionals in special sites all over the world then you may be disappointed, my type of sand-sculpture is ‘between the tides’ which means it is made with ordinary beach sand and in the time between tides, usually remaining on the beach only until the next high tide. 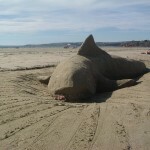 Beach sand is not favoured by the professionals, the grains are too round and do not stick together well enough or allow for the crisp outlines they require. 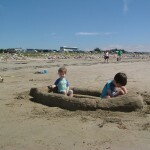 The time between tides is also not sufficient for these elaborate structures as each must be built up over time, with formers being filled with the correct mixture of lake sand and water and tamped down until firm, where upon a second former is placed on top and filled and tamped down and only when that is firm and stable enough can the subsequent formers and layers be added. As you can guess this takes quite a long time and, indeed, a team of people. 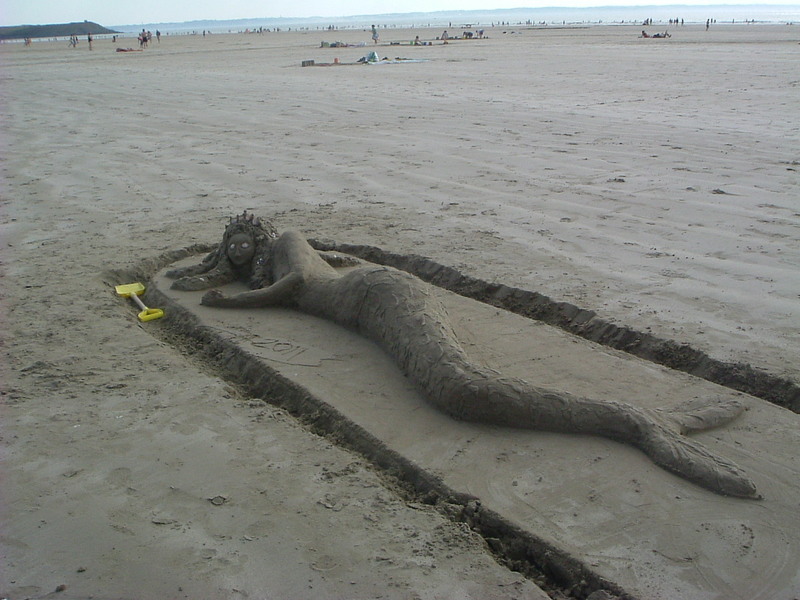 There may be only one named sculptor, though frequently there are the ‘rough sculptors’ who take the blocks of sand away and the finisher who does the fine work. 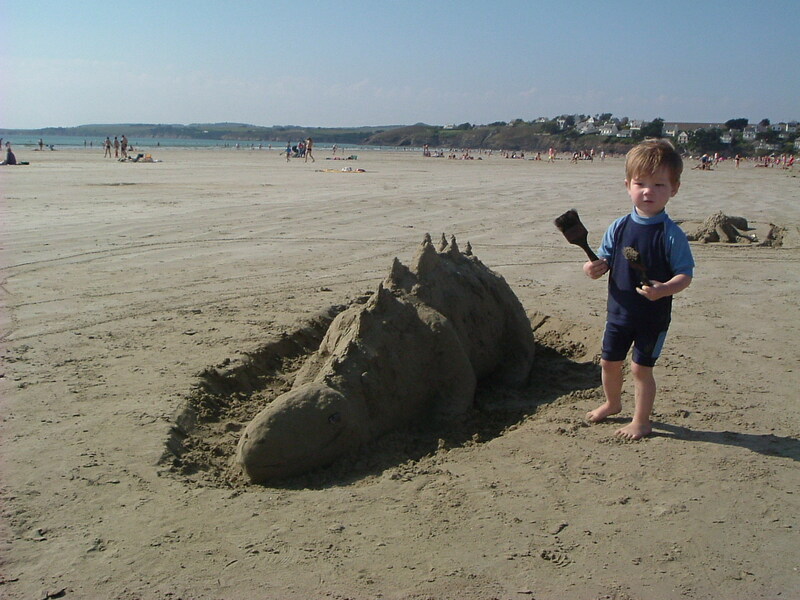 However, BTT sand sculptures are possible for everyone who has a bucket and spade and a knife (normal cutlery – not necessarily sharp) and a brush or two (the cheapest from the DIY store) and sand that will stick together – if it would make a reasonably firm sand castle tipped from a bucket – it can be used to sculpt. 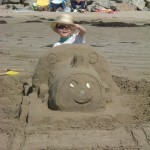 This year my husband and I have been away with family again, our eldest son, wife and two small grandchildren. 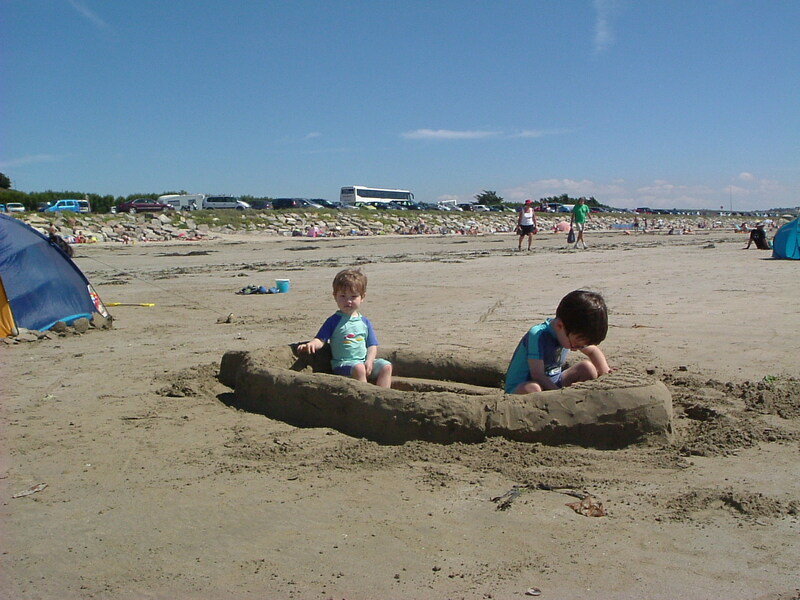 This has changed the basic repertoire of my sculptures, which were getting more arty and less representational, back to where I started, sand-sculpture for my own children to play in. 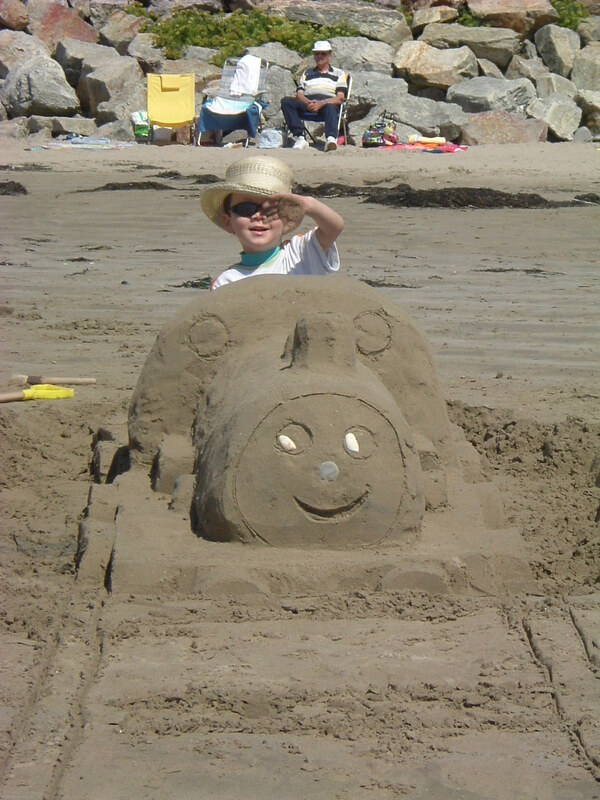 So this year I have had to make a series of Thomas the Tank engines, boats and aeroplanes as well as having the lee way to make a stegosaurus, a shark and my trademark mermaid. I’ve wanted to write a page on Poetry, but you know it has a funny effect on people. I suppose it is from forced poetry at school or something, but to me poetry has a life of its own. I know it has pursued me from about the age of nine when I realised that you could not only learn poems but you could also write stuff that had rhythm and rhyme. I blame my mother… though that should be praise, she could, and would, recite ‘The Lady of Shallot’, or great swathes of ‘The Rime of the Ancient Mariner’ off by heart. I learnt large sections of these two and Cargoes and my long time favourite GK Chesterton’s Rolling English Road. Poetry has got me a free weekend ticket to the Port Eliot festival these last 3 years.. that’s amazing enough. What is even better this is because we perform at this festival and people who are not related to us, nor are our friends, come and listen! 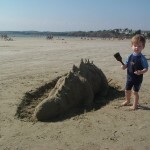 How magic is that! This year we took as our theme Elephants, from the crest of the Lords of St Germans (who own the Port Eliot estate) and Castles. We perform in the Round room, an acoustic gem where if you stand under the central chandelier there is no need of amplification, and which is painted all round by the late Robert Lenkiewicz in a weird and wonderful montage. Genres – if life isn’t pigeon-holed why are novels? Genres are the bane of my writing life. One of the things you are supposed to be able to tell the agent or publisher that you are sending out your synopsis, 3 chapters and covering letter to is what genre you book fits into. Sometimes novels come as they are, mixed up just like life. Even for Amazon you have to choose 2 genres maximum to put your ebook in. When I put my books out for beta reading I must ask my readers what genre they would put each book into – if really pushed to choose one, or two. I might then get a consensus I can work with. I have spent most of this week cake decorating. I have barely done any of my work on slate, none on writing and very little around the house and garden. This, as you may have guessed, is a special cake. This is my nephew’s wedding cake. 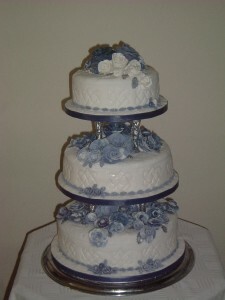 Three tier, top and bottom in rich fruit, very rich fruit, and the centre one of chocolate sponge. 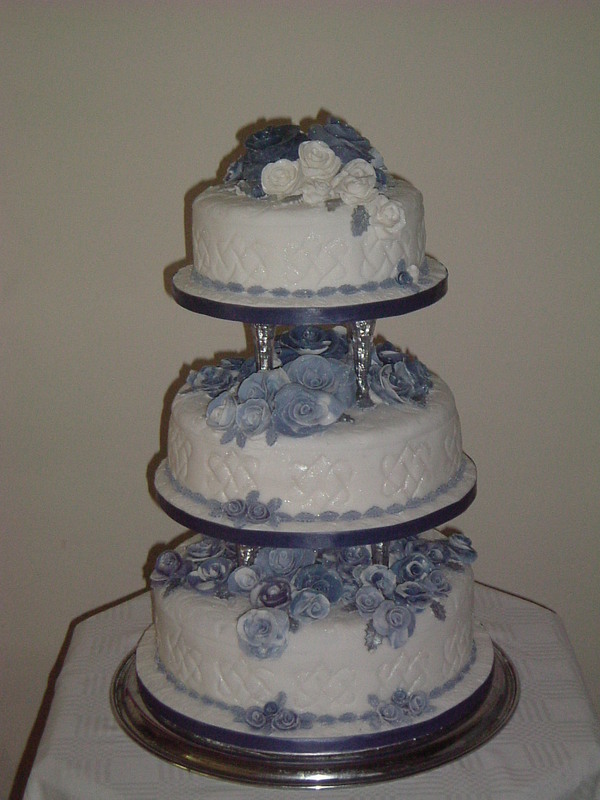 There were over 90 fondant roses on this cake, all made over a number of evenings. I created the tool to imprint the Celtic love-knot round the sides and repousséd out of thin aluminium sheet (empty beer cans) the tools to imprint rose and rose-leaf patterns for the top and edge of the cake. Just covering the cakes and arranging the roses took over eight hours – nevermind the making of the cakes and the roses. If you ever need a superb and very versatile recipe for a very rich moist fruit cake then here is one we have used for over 40years – it will fit any size or shape of tin – but only comes in imperial measurements! Then follow this recipe PER PINT ! Double line the tin with two layers of greaseproof paper. Spoon into lined tin, spread to make sides slightly higher than centre. For 3 – 3 ½ hours until a skewer comes out without uncooked cake mix on. ***Check with your own tins – take the measurement to about ½ inch down from the top of the tin – not right to the top. Okay, the decision has been made. I need to get someone else to proof read these and have found someone with the training who’s willing to do a deal with me, for a cut of each ebook sold, she’ll proof read for me now. Wow, that’s a commitment. I still have to work through and put in all the corrections, and that will take time, but I am hoping for a first book up by the end of September on my own website annmade.co.uk under Books. I guess that makes me a publisher as well, my publishing house :- annmade books. My logo, of 3 golden hedgehogs, would adorn the cover of any print book and as I have to design covers for the ebooks I suppose they will incorporated on that. That’s another whole new ball-game – cover design. When you get into writing you hear all sorts of stories that you may not have paid any attention to before. I once heard a talk by a top Mills and Boon author. At that time I had never read a Mills and Boon of any description, but don’t knock it as an author, this lady travelled all over the world on expenses, with husband included as he was her secretary and general factotum, doing her research and later her promotions as her books sold world wide, plus her writing had bought them a beautiful small estate in Cornwall. So, I thought, perhaps I could turn my hand to these shorter novels to a formula. Mills and Boon kindly give you their, quite strict, outlines of the types of book that they want for each of their particular division of print. I took a number of different types of Mills and Boon out of the library and read. It was, as is always suggested, formulaic, and a bit far fetched for my liking. I can’t say I really enjoyed them, they just weren’t my type of book (from a reader’s point of view) However, I thought I’d give it a go and with a sort of outline in my head I started in the ‘mills and boon vein’. I had to give up though, I just couldn’t control my muse enough to their patterns, or make my heroines air-headed enough / deluded enough / beautiful enough for the style or my Heroes manly, domineering but sensitive, handsome enough.. it was all a bit too unreal. Dear reader, I gave up on my rags to riches Mills and Boon route. If I had been a different type of writer I might have been able to do it, but I would put myself under the ‘muse led’ group of writers and, frustrating though it can be, I am happiest there. Oh! Quiet lost the thread there!! – Cover design. Sarah Steel (or was it Wood) told us that she had no control over her covers. That Mills and Boon had total control, to the effect that one of her books showed the handsome hero wearing tweeds, when anyone who read the book would soon discover that he’d never been seen wearing such attire, and as with that publishing house so it is with many others. The bigger stars may get a veto, but rarely can they stipulate what they want to see on the cover – that is deemed a separate art altogether .. and now I have to delve into that side of publishing as well….great ! I love learning things and this will be a learning curve!! publish on Amazon .. even without an ISBN! Oh! My! I have just found out that it is possible to publish straight to kindle through Amazon, with a 30% / 70% deal and without even having an ISBN number – that is amazing and great. Why? because ISBN numbers are generally quite expensive if you are buying only a few… (they get much cheaper per number once you are buying a thousand plus) and each different version requires a different ISBN number! Amazon give your e-publication with them an Amazon number instead. So – new plan – after I publish on ANNMADE BOOKS in Mobi (for kindle) in EPUB, (for Nook and Sony Ereaders), and pdf (for anyone else) I can then also publish on Amazon for kindle! I have to say, I am really excited about this idea. I have to get someone else to do my proof reading, even if I still have the task of doing all the corrections, so that when the books do go online there won’t be so many gaffs on the page. I’m lucky in that I can put my books on my own website, annmade.co.uk, which usually sells my popular range of slate ware. This business is in its fourth year and has been steadily growing. The books will go under a new tab, annmade books – I think it sounds like a publishing house already!! You can’t proof read your own work. I had thought that if I left a piece of work long enough I would be able to see the mistakes. After all, as I used to be a teacher it is second nature to me to spot the mistakes. I see them all the time in newspapers and books that I read. But no, I tried, but found that I was soon reading what I had intended to be there rather than what was actually there. Note to myself… don’t be so critical… it’s hard to spot mistakes. 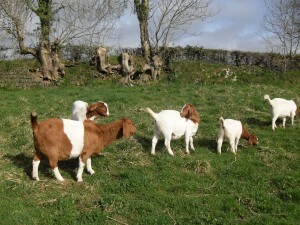 The last of the new goats arrived today, a kid called Nougat, she joins our other five new British Boer Goats, all brown and white blotches and floppy ears. Jasmine, Splash, Snowflake, Tallulah and Blazey.